And to further his point: wipe our hands and other things on it just to throw it away. But I digress. But there I went digressing again. When I had this initial insight about trees and how amazing they are and how I was just seeing this one little thing about them that was just so happening to cause me a bit of worry (because I was wondering how I’d ever truly be able to keep our patio looking tidy), I realized that this insight surely must apply to other aspects of life and I thought, I really should keep this one in mind. Within a couple hours I was facing up to another manifestation of my tendency to provide myself too narrow of a view on a situation. This time it involved Mr. Entropy and some dirt. We were at a little farm up in a park near our home. 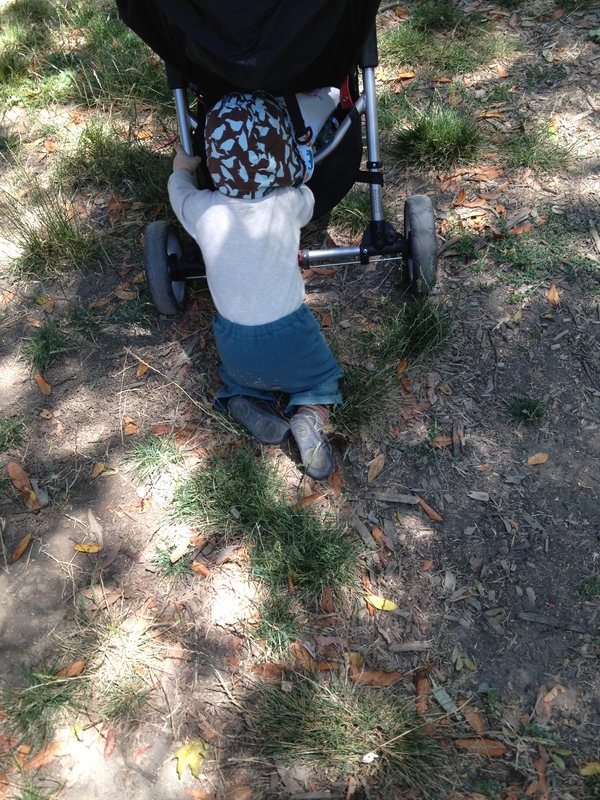 I found myself quite frustrated at my son’s insistence around pushing his stroller in a crawling position. Through the barnyard dirt. 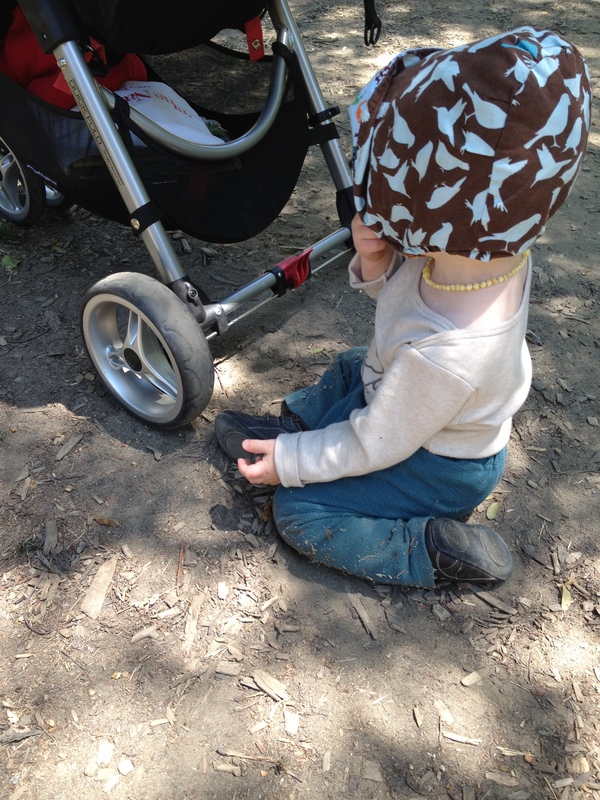 Then there was the oral wood chip inspection. And the frantic run down the path way with a fall right into a mud puddle. The climbing up the hill was fine except that I had the precarious job of pushing the stroller up as well all the while keeping a watchful eye on my little guy. I was not happy. But somewhere in the midst of what I considered to be unbearable chaos (I know, it really wasn’t that bad, but this is a post about relativity), I remembered my earlier insight and had a moment of gratitude. Which did a lot to calm my nerves. So much of what we do as parents could be analyzed in terms of relativity. Sure, we have an idea of how things should go. But often so does the kid. And who is to say whose desire is more worthy of follow through? 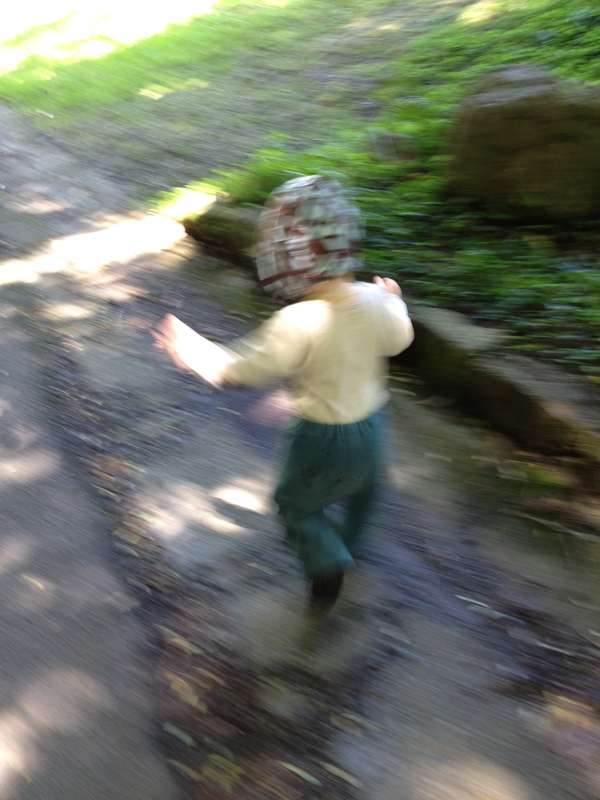 I’d like to think that I give my little guy a lot of autonomy (for a thirteen month old) and that as time goes on I will continue to give him more room to build his sense of self and personal velocity. But it is a matter of compromise, bearing in mind my respect for him especially in the moments when I feel least capable of doing so, and remembering that all things are relative. Looking at this notion of relativity through an even more global lens, the stark contrast between the daily minutia and the constant potential for big change which we each embody seems even more amplified in the early years of human life. Because there is so much mess on the minuscule level, and and perhaps the greatest amount of yet-to-be-determined that we ever have- before we even know what we’ve got. We are so fragile, and so strong. So harsh and so vulnerable. So self absorbed and so generous. So eager to learn and so scared of the unknown. So easily blinded to the many blessings bestowed upon us that it seems very important to make a regular practice of remembering all that we have at our disposal. To do with the best that we are able. To me, this is the real philosophical stuff of parenting. I am constantly amazed at what opportunities a day with my son offers me. Aside from my own life, he is the best gift that I have ever received. And to truly receive him is a moment to moment practice. A funny thing happened when we arrived home. A little squirrel popped out from somewhere as I was unloading the car. I think that she hitched a ride down the hill with us. She’s stuck close by ever since. 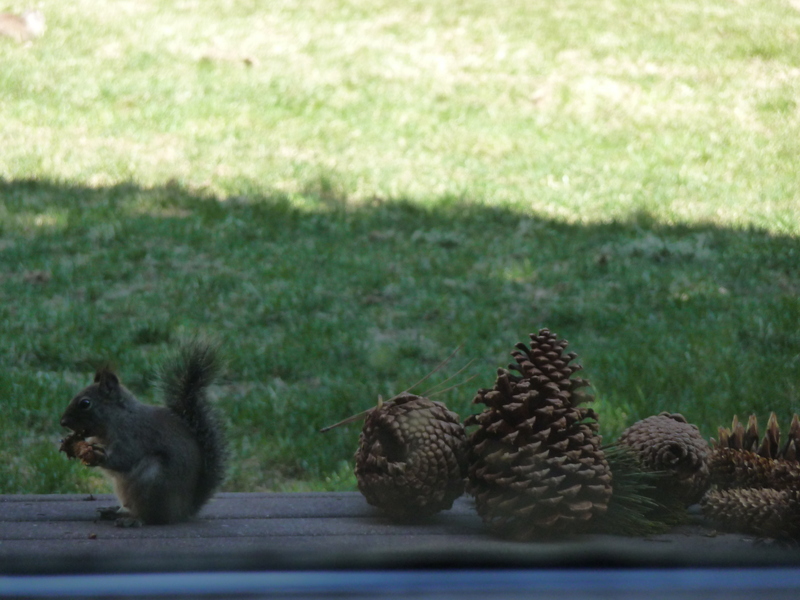 As I write, she’s having a snack outside my window. I’ve decided to call her Adele. Somehow I think that she means to stick around a while…. This entry was posted in Daily Musings on July 30, 2012 by elizatwist.